Yes, Revolution is approved for use with pregnant and lactating females. 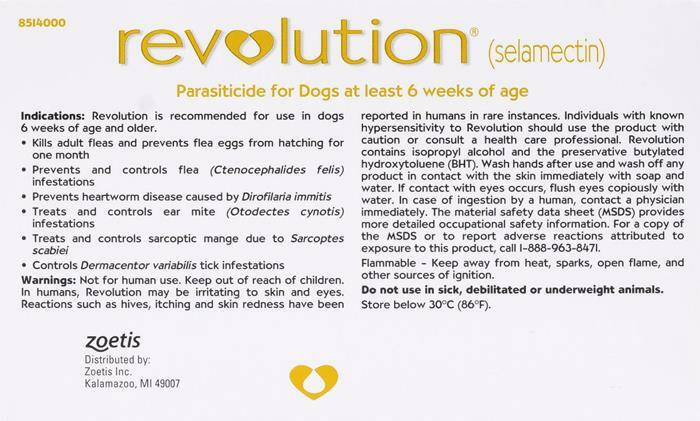 Does this Revolution protect against other intestinal worms (hookworm, roundworm)? It doesn't say here, but on the Stronghold description (which is the same active medicine, selamectin) it says it does protect against those worms. Yes it covers most common intestinal worms including hookworm and roundworm. It is 12 doses in one box. Does this prevent tapeworms too? and does it repels all kinds of ticks? Revolution is effective in controlling tick infestations due to the American dog tick only. (Dermacentor variabilis). It odesn't kill treat tapeworms. Hi there I live in Ontario, Canada. Do you have to have a vet prescription for Revolution flea drops. I have a retail store and would like the best to sell. We have been using Revolution for a number of years and have been very happy with the results we have gotten. It is easy to apply and it is all in one dose.